I should probably answer Weekly Geeks this week, since it was my own question. It wouldn't be very encouraging if I didn't, would it? I asked people to give parents ideas on how to entertain the kids over the summer or share a childhood summer memory. Now my husband has the best summer memories because he spent all summer swimming and water skiiing at his parents summer place. I wasn't lucky enough to have a summer house (which I whine to him about) so Ill skip the summer memories. I'll do #1 and #3. #1) I remember spending hours lying on my bed reading during the summer. When I got into my teens, I was staying up until 4 am reading Stephen King novels. But before that, I would read Nancy Drew (Carolyn Keene) novels cover to cover. I also liked Blossom Culp (Richard Peck), the Ramona series (Beverly Cleary), and The Secret of NIMH (Robert C O'Brien). This summer, I think my daughter and I will be reading lots of Clementine (Sara Pennypacker), Junie B Jones (Barbara Park) and Animal Ark books (Ben M Baglio). #3) There are lots of fun family destinations here on the island to visit over the summer. This is just a few of my favorites. 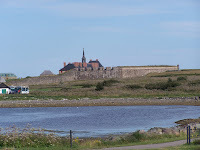 Fortress of Louisbourg: The government of Canada had the ruins of the former French fortress reconstructed back in the 1970's. The fortress fell to the British in 1758 and was destroyed. Now reenactors play the parts of average people and officials from the 1700s. Upon entering the gates, visitors are stopped by "armed" 18th century guards and if you aren't careful you might find yourself in jail! Usually they are pretty friendly though ;). You can ask the actors questions and they will tell you all about their characters and the life they lived in Louisbourg. It's a lot of fun. The Highland Village (Iona): A collection of houses from the early 1800s to the early 1900s were moved to this site to preserve the history of S cottish settlers on the island. 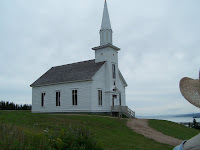 The site includes a church, a schoolhouse, general store and blacksmith. More actors can be found here as well. You and the kids can take a ride on a horse and cart. The Cape Breton Highlands: One of the best places for hiking, swimming and camping. Beautiful sandy beaches like Black Brook and Ingonish are great for the kids. There are awesome hiking trails and look-offs. You might even see a moose! The scenery is indescribable. One of my earliest memories is from Louisburg. We went there on a family vacation when I was *really* young. I don't know if they still have it but they had rooms set up with "realistic" portrayals of army life, including one room with a wounder solider on a bed. I started screaming that his was hurt and someone had to help him. I thought it was real and that people were just being asses and not helping him. I may have "made a scene." Wow, I love the landscape. This looks like a beautiful place. Definitely have to get to your part of Canada at some point. It looks simply stunning. Summer memories? Everyone on our street had a pool, and all the kids would rotate each day to someone else's so we spread it around, so to speak. We now belong to a swim and tennis club, there are four in our area, and it's a great place to relax and write in the afternoons. Oh, hmm, maybe I should go there for my vacation. I'm looking for a place to take a solo trip, somewhere I can walk a lot, see some history and write (all safely, of course, since I'm a chick). Such beautiful places! I want to go! I love Cape Breton. I really should visit more often! I've only read Nancy Drew and none of the Ramona series but I'm working my way through Junie B. Jones. They make me giggle. Sassy- lol! I think you're reaction may have made them rethink that whole idea. I've only ever seen them playing cards. Maree- I'd never be able to do that now. I'm ready for bed by 11pm these days. Rikki- It's so beautiful up there. That's a pic of Cape Smokey. Karen- That sounds like fun. Not many people had pools when I was young. Bookfool- You should! It is very safe and the people are super friendly. Puss- Junie B is a riot!